Derry lost out to Wicklow in Celtic Park. Colm McGurk's home debut as Derry senior hurling manager ended in a 10-point defeat to an impressive Wicklow side in Sunday's National Hurling League Division 2B encounter. The Ok Leafers, who had won one and lost one of their opening two games, were well in the game during the opening exchanges but once Wicklow full forward Andy O'Brien took a grip of proceedings the visitors' extra class showed and Derry were made to pay for missing too many first half chances. Derry started well against the visitors who came into the game with two wins from their opening two games. The Celtic Park pitch was in excellent condition considering recent rain fall but understandably soft which made things difficult any time the ball was allowed to drop.The home side hit the front on two minutes when Brian Og McGilligan touched down a high pass beautifully for Aaron Kelly to split the posts from 45m. 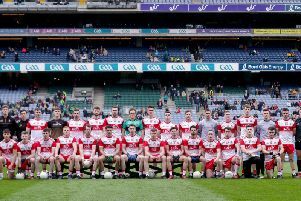 Ruairi Convery doubled the advantage within a minute an when Odhran McKeever, promoted from last season's minor squad, found his range on seven minutes Derry were three points to the good against a Wicklow side still waiting on its first shot. Midfielder Ronan Keddy broke that stalemate with Wicklow's first point on eight minutes and while Convery's second point restored Derry's three point lead, Wicklow were ominously off and running. Danny Staunton became the second Wicklow midfielder on the scoreboard minutes later but by then it had become the 'O'Brien Show' as the experienced full forward took the game by the scruff of the next with 1-03 in the space of 10 minutes. Everything Wicklow sent in, was sticking with O'Brien and he wiped out Derry's three point lead with one brilliant catch under pressure. He turned with runners each side but as Derry waited for him to pass, he forced his way through the middle and despite failing to connect with his initial shot, he was alert enough to pull on the loose ball and find the net. That signalled a period of Wicklow dominance. Derry were competing well but eight first half wides to the visitors three told a story of missed opportunities. And Wicklow made them pay with O'Brien a superb focal point in attack. Twice in quick succession he won a high ball in, held off Sean McCullagh and hit points as Wicklow established a 1-05 to 0-5 lead by the 25th minute. Indeed, O'Brien could have had his second goal seconds later when he again won a high ball, pulled away from the Derry defence and hand-passed an effort which struck the bar before bouncing over for his fourth point of the half. The loss of Ruairi Convery to injury didn't help Derry's cause and with Darragh McCloskey switching to O'Brien, the home side went into the break trailing 0-06 to 1-09 in a game they had dominated for the first 15 minutes. Alan Grant opened the second half scoring with a free but within 10 minutes Wicklow had all but put the game to bed as Keddy (65), Christy Moorehouse (2), O'Brien and Staunton left Seamus Murphy's visitors with a comfortable 1-15 to 0-08 lead. Derry sent on the experienced Liam Hinphey but his afternoon lasted less than 15 minutes as two yellow cards sent him for an early shower and compounded a difficult afternoon for McGurk's team. The remainder of the match resembled little more than exhibition stuff for the visitors, despite a late goal for Na Magha's Alan Grant giving the scoreboard a more realistic look for an Oak Leaf side who should have been closer given their first half opportunities .